Jennifer Murray was one of many musicians who entertained eventgoers during Main Street Greenville’s June First Friday event. Main Street Greenville’s June First Friday event provided area residents with food, music and games in downtown Greenville. Mya Conway, of Greenville, tries to quickly stack cups during Main Street Greenville’s June First Friday event. 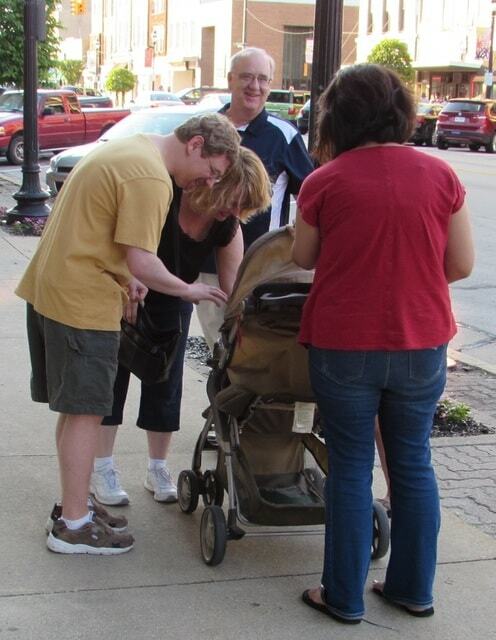 GREENVILLE — Music, food, deals and an opportunity to learn more about volunteer organizations in Darke County was the focus of Main Street Greenville’s “First Friday” event for June. This month’s gathering, from 6 to 9 p.m. in downtown Greenville, was sponsored by Interim Healthcare and the Law Office of Randall E. Breaden, LLC. The event featured more than 10 different musicians and musical groups performing live. Free hamburgers and hot dogs were provided by Greenville National Bank, while the Christian Missionary Alliance Church served up free ice cream. Many downtown businesses kept their doors open late and offered discounts to eventgoers. Fifth Street was closed to traffic to host a volunteer fair, highlighting the work of multiple, nonprofit area organizations. These groups provided games and snacks and shared information with those attending. Among the organizations present with booths and displays were Fish Choice Pantry; NextStep Ministries of EUM Church; Garst Museum; Farmer’s Market; Recovery & Wellness Centers of Midwest Ohio; State of the Heart Hospice; Arcanum Wayne Trail Historical Society; Big Brothers/Big Sisters of Shelby and Darke County; Brethren Retirement Community; First Heavy Metal Church of Christ; Cancer Association of Darke County; Darke County Board of Developmental Disabilities; Friends of Darke County Parks; and Darke County YMCA. Main Street Greenville holds a number of community-building events throughout the year. The organization promotes historic preservation and economic development, resulting in a cultural downtown district that attracts and retains businesses and entrepreneurs, making downtown a desirable destination. Learn more about Main Street Greenville at www.mainstreetgreenville.org.